Our communities are jigsaws where successful business needs strong communities, and strong communities need successful businesses. Local Works helps clients and communities to clearly define their piece(s) of the jigsaw, who they need to connect with and how, to achieve their goals and objectives. The result… smarter connections, better business, better bottom line, better place to live, learn, play and earn. 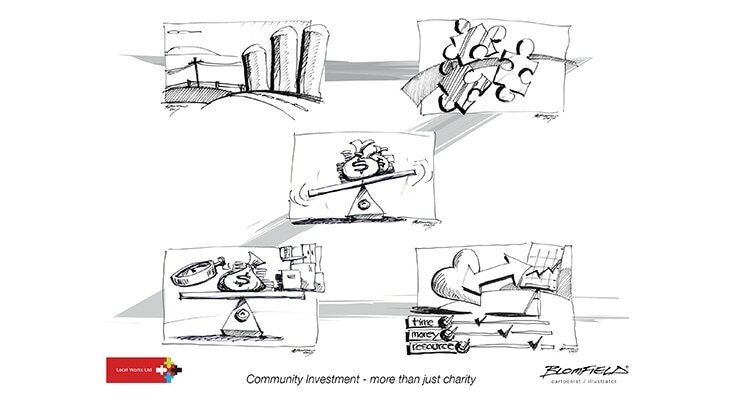 Drawing on over 25 years experience in corporate citizenship, cross-sector collaboration and community development, Local Works will work with you and you​r team to develop and deliver innovative and enjoyable community investment strategies, projects and activities that have impact. is a considered deployment of money and resource across a continuum where motivations for engagement range from purely altruistic to a deliberate ‘enlightened’ self-interest. encompasses a variety of tactics and tools across the continuum to achieve participants’ desired outcomes, individually and collectively. usually seeks to pool and leverage existing resource for mutual benefit.